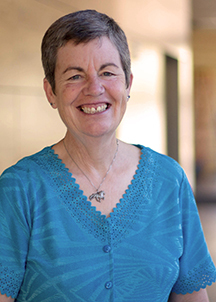 Linda Eddy is an associate professor at Washington State University College of Nursing Vancouver. She has many years of experience teaching courses in pediatric nursing, family nursing, program evaluation and nursing research. Her clinical practice includes pediatric nursing and community health nursing with emphasis on children and adolescents with special healthcare needs and children and adolescents who have experienced abuse. 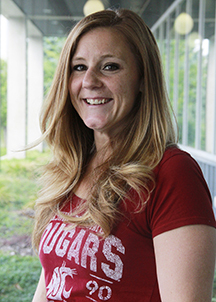 She has worked with the University of Washington Center on Outcomes Research in Rehabilitation (UWCORR), an interdisciplinary and inter-institutional center, on studies that examine the impact of pain and fatigue on the quality of life of children with disabilities and on their families. Another research focus is program and curriculum evaluation. Linda is sought after as an independent consultant to nursing and healthcare programs to provide external evaluations. She continues her work with a newly-developed nursing program at Birzeit University in the West Bank, begun during her Fullbright Award in 2010. She has recently become the principal investigator of a large, statewide funded project entitled “Youth and Family Behavioral Health Workforce Collaborative” and is currently studying the efficacy of youth peer counselors as well as workforce development in youth behavioral health. Mixed methods and evaluation research. Eddy, L., Hoeksel, R. , Fitzgerald, C. , Doutrich, D. (2017). Promising practices in advancement of academic nurse educator careers: Developing scholarship from program grants. Nursing Education Perspectives (in press). Fitzgerald, C. Purath, J., Van Son, C. , Duvall, D. , Eddy, L. L.
(2017). A Course-Based Approach to the DNP Project: Supporting Student Growth from Concept to Completion. Nurse Educator, 42(5). Eddy, L.L., Doutrich, D. (2015). Clinical Inquiry with Vulnerable Populations. Keynote address published in Proceedings of Oregon Nurse Quality and Research Consortium Annual Conference. Eddy, L. L., Bailey, A., Doutrich, D. (2014). Families and community public health nursing. In Kaakinen, Gedayly-Duff, Coehlo, & Hanson, Eds: Family Health Care Nursing: Theory, Practice and Research (5th edition). Eddy, L. L. (Editor) (2013). Caring for Children with Special Needs and their Families: A Handbook for Healthcare Providers. Wiley-Blackwell Publishers. White, D., Kaplan, L., & Eddy, L.L. (2011). Characteristics of patients who return to the emergency department within 72 hours in one community hospital. Advanced Emergency Nursing Journal. 33(4), 344-353. Eddy, L., Khastou, L., Cook, K., & Amtmann, D. (2011). Item Selection in Self-Report Measures for Children and Adolescents with Disabilities: Lessons from Cognitive Interviews. Journal of Pediatric Nursing, 26, 559-565. Eddy, L., Engel, J. (2008). The impact of child disability type on the family. Rehabilitation Nursing, 33(3), 98-103. Eddy, L., Doutrich, D. (2010). Families and community public health nursing. In Kaakinen, Gedayly-Duff, Coehlo, & Hanson, Eds: Family Health Care Nursing: Theory, Practice and Research (4th edition). Eddy, L., Doutrich, D, Higgs, Z, Spuck, J, Olson, M., Weinberg, S. (2009). Relevant nursing leadership: an evidence-based programmatic response. International Journal for Nursing Education Scholarship, 6(1), article 22. Giddens, J., Eddy, L. (2009). A survey of physical examination skills taught in undergraduate nursing programs: Are we teaching too much? Journal of Nursing Education, 48(1). Eddy, L., & Cruz, M. (2007). The relationship between fatigue and quality of life in children with special needs: A systematic review. Journal for Specialists in Pediatric Nursing, 12(2), 105-114. Eddy, L. (2007). Evaluation research as academic scholarship. Nursing Education Perspectives, 28 (2), 78-81. Eddy, L., & Epeneter, B. (2002). The NCLEX-RN experience: Qualitative interviews with 1998 graduates of a baccalaureate nursing program in the Pacific Northwest. Journal of Nursing Education (41),273-278. Eddy, L., & Walker, A.(1999). The impact of children with chronic health problems on marriage. Journal of Family Nursing, 5, 10-32. Walker, A., Pratt, C., & Eddy, L. (1995). Informal caregiving to aging family members: A critical review. Journal of Family Relations, 44, 402-411.